It's no secret. All managers share the same common goal... to increase worker efficiency. To support this idea, studies have shown that "increasing employee engagement investments by 10% can increase profits by $2,400 per employee, per year" (Workplace Research Foundation). This is great news for any business looking to increase their profits! But how does a manager go about increasing engagement among their workers? What are some strategies managers can start implementing today? 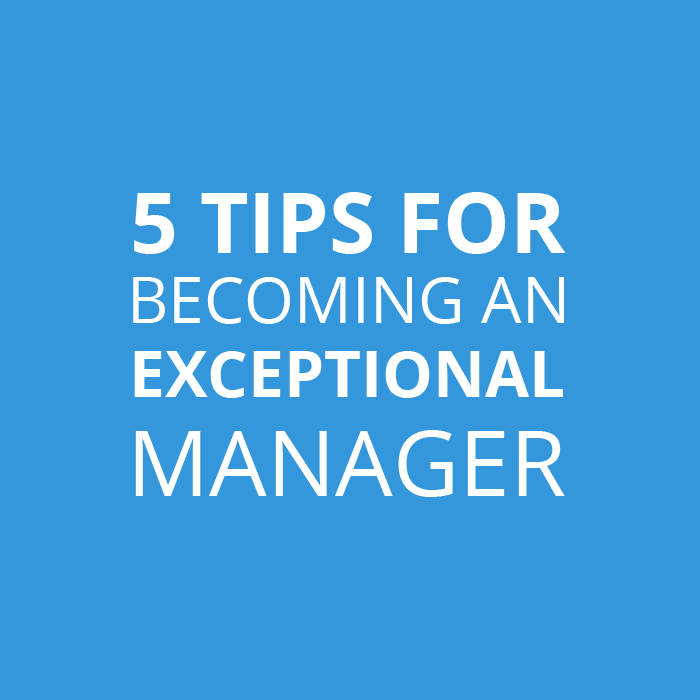 Let's dive into the 5 Tips for Becoming an Exceptional Manager, and find out. Every business manager (and really, ANYONE for that matter), can benefit from the powers of visualization. While not directly tied to increasing employee engagement, visualization is a useful tool for achieving success. You want to increase productivity by 10%? Visualize it! But how exactly does one practice visualization? It all starts with a desire. In order to reach your goals and attain success, you first need a clear idea of what you want. Is there a project you desperately wish to complete? Is there a level of sales you wish to reach this week? Try to narrow the scope, and define your desires as concisely as possible. Here's a good example, "I wish to become the new general manager for my company." This is a great starting point. The goal is clear and succinct. Now you are ready to start visualizing. 1. Use the mind. Start by envisioning your desires, and "see" yourself at the end goal. Imagine yourself as the new general manager. What new clothes are you wearing? Do you have a new, reserved parking spot? Are people treating you differently? View your goals as your new reality. 2. Practice daily affirmations. Often associated with mediation, this is an excellent way of reminding yourself of your desires. For example, repeat to yourself, "I will become the new general manager" every morning, on your way to work, or as frequently as possible. 3. Write it down. Use a permanent marker and make it clear. This is what I want. And this is what I'll achieve. Try to see failure as a non-option. If you wish to learn more about visualization, I highly encourage you read Think and Grow Rich by Napoleon Hill. He goes much further in-depth on these concepts and it's a wonderful read. Every manager should own a copy of this book! Simply put, incentives increase employee productivity. How you pay your employees can affect (positively or negatively) the efficiency of your company. Every great manager understands this concept. But, which methods are the most effective? 1. Bonus Pay: This well-known system is easy to understand. You work hard now, and you will be rewarded later. Simple. But, keep in mind, if employees feel that bonuses are inconsistent, unreliable, or anything less than their expectations, future productivity can have an adverse effect. 2. Piece Rates: These are payments based upon quantity through fixed amounts. For example, a blogger is paid for each blog post they write. That blogger will have an incentive to produce more articles, and thus earn more money. However, while this does increase productivity, often times the quality diminishes. A blogger may write 20 posts for you in a single day, but at what value? Will this help or hurt you in the long run? 3. Profit Sharing: This method links employee pay to the profitability of the firm. Much like offering company shares, there is an incentive for workers to increase productivity, since their pay is directly tied to the firm's performance. Case studies, such as the one conducted by the National Bureau of Economic Research, have proven the effectiveness of this approach. Rather than rewarding quantity, profit sharing rewards quality. Big difference. As a manager, keep these incentives in mind. And choose what works best for you. To learn more about these techniques, take a look at Managerial Economics and Business Strategy by Michael Baye and Jeff Prince. It's an excellent source for optimizing managerial strategies. In order to ensure workplace productivity, managers must also use a good system for monitoring their employees. The goal is to confirm that work is being completed AND maintain a high level of trust. It's a fine balance. One method is to use spot checks. Managers can randomly choose different times of the day to "drop by" and check on the work of their employees. This encourages workers to consistently work on their projects, as they never know for certain when the manager will show up. While an effective approach for increasing productivity, this does not increase the level of trust. It's important to not come across as overly superior when monitoring your employees. Otherwise, the workers will feel like you're a babysitter, rather than a manager. And that's not good. Another approach is the use of an online time clock system. This method allows managers to monitor the activity of their employees, such as when employees clock in, go on break, clock out, etc. without being seen as overbearing. The benefits of an online time system, rather than a wall-mounted clock, is that employees can use their personal phones (or tablets) as a way of recording time. This in turn, gives a greater sense of workplace freedom, and therefore nurtures a higher level of trust between the workers and managers. A successful manager will likely use a combination of these two methods. Checking in periodically, while simultaneously giving employees more freedom. This mixture fosters a positive and productive work environment. Proper communication between managers and employees can make a HUGE difference for the outcome of a project and the overall efficiency of a company. But how can you achieve this as a busy manager? It can be difficult to reach every employee in a day, sometimes impossible, which is why managers are increasingly in need of help. To solve this issue, there are plenty of great services that enhance workplace communication (and usually for a decent price). One great resource is Slack. A relatively new company, Slack has simplified the way in which businesses collaborate. This streamlined messaging service is a great tool for companies to create teams and subgroups, and allow for open communication with their employees. If you're not a fan of the service, try another. There are plenty of alternatives out there. But whether you're a Slack supporter or not, the BIGGEST lesson learned from their success is that messaging is vital for businesses. Employees respond well to giving feedback, delegating tasks, and asking questions through the medium of short comments. Therefore, managers should be looking for tools that utilize this form of communication. Here at Webtimeclock, we are aware of this idea and have created a feature for commenting directly on an employee's time card. This creates a greater link between the employee and the manager, and fosters an increased level of communication. Managers are often stretched for time. So having a feature that allows employees to easily make a note or ask for paid time off, without having to directly speak with the manager, just makes sense. It's now time to take stock of your managerial tactics. Are they aligned with your short-term and long-term goals? Are there things you could be doing better? Have you followed tips 1-4? Take a moment to write down your strengths and weaknesses. Try to think about the needs of your company. Can communication be improved? Do you need a better time and attendance system? Have your employees reached maximum productivity? Spend a few minutes evaluating the efficiency of your resources. And be open to change. Now, with these thoughts in mind, create an action plan. Clearly state what you need. Detail how to get there. And then, get it done. While there are plenty of strategies for improving efficiency, all great managers know that management is not an exact science. It's about people, coming together and sharing a common goal. If you can visualize success, and inspire your employees to share the same vision, you will truly be an exceptional manager!